Stability in expansion, greater constellation, union of polarity, framework of connectedness. All parts make up a greater whole. The Crystal Tone presents a higher order of coordination – offering complex stability, creative cohesion, and comprehensive vision. Here, we perceive the coherency of the whole as a composition of related parts, honouring the elaborate inter-workings of life as a mandalic synthesis. Crystal Tone asks us to universalize – to translate our knowledge and insights that they may be universally applicable, relevant and shareable with all, assisting the elevation of the common good. Tone 12 affirms that we ourselves embody the highest qualities of internal and social architecture. Like a crystal with its unique facets individuals which constitute the power of a strong, interdependent community. Tone 12 offers the recognition that in a healthy whole-system the needs of the individual are met by the collective, and in return the individual feeds the aspirations of the collective. May we strive to collaborate with one another, combining our gifts and enhancing our efforts, while remaining clear and lucid in the grace of our autonomy. The reflective question that we ask ourselves this moon is : How can I dedicate myself to all that lives? 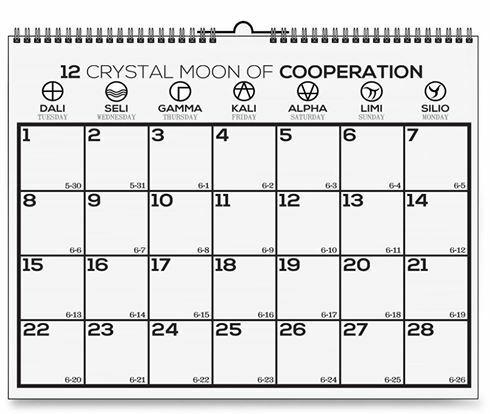 The first day of any moon starts on the DALI radial plasma which correlates to the crown chakra.